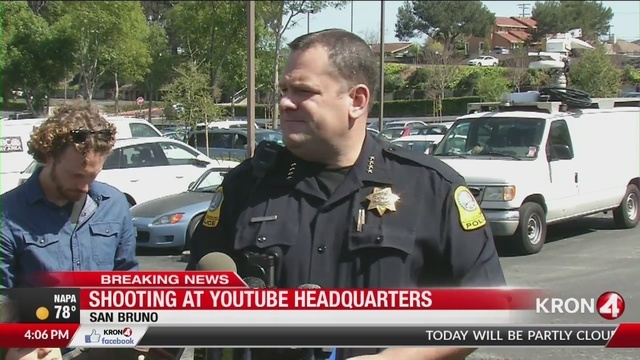 SAN BRUNO (KRON) - A woman shot multiple people Tuesday before turning the gun on herself at YouTube's headquarters in San Bruno, according to police. Sources tell KRON4 that the shooting appears to be the result of a domestic dispute. Law enforcement officials have identified the suspect as Nasim Aghdam, 38, of Southern California. The woman drove up from San Diego Tuesday, according to a KRON4 source. There are no words to describe how horrible it was to have an active shooter @YouTube today. Our deepest gratitude to law enforcement & first responders for their rapid response. Our hearts go out to all those injured & impacted today. We will come together to heal as a family. 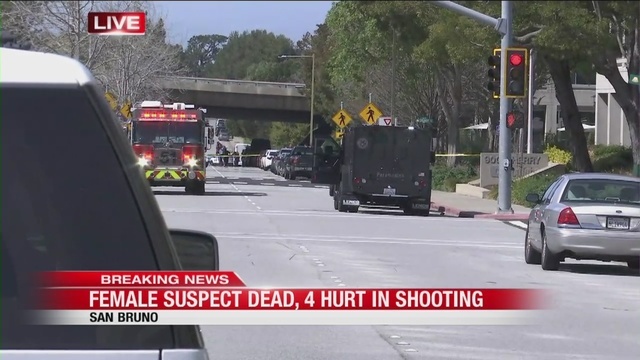 The shooter is believed to be dead from a self-inflicted gunshot wound, San Bruno Police Chief Ed Barberini confirmed during a press conference at 2:30 p.m. There are at least three victims being treated for gunshot wounds at San Francisco General Hospital. 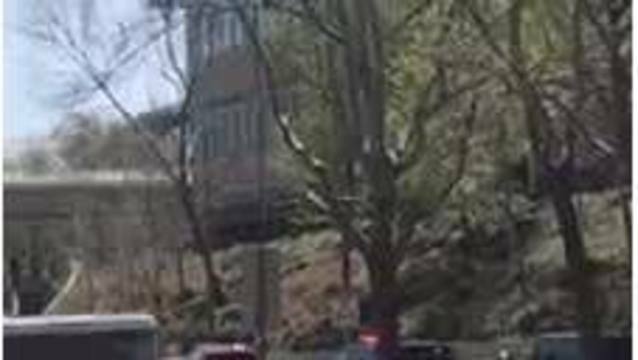 A fourth person injured has a twisted ankle. Police say the shooter used a handgun. The shooting happened while employees were having lunch on a patio. 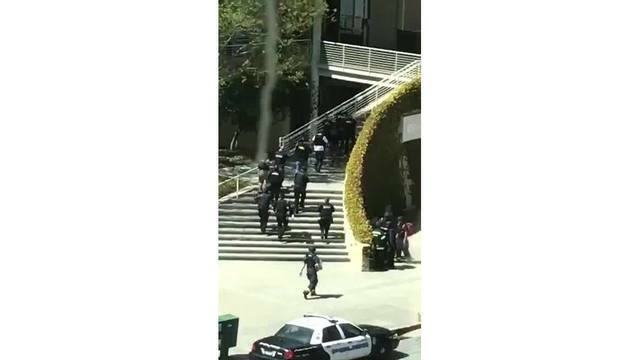 At 12:46 p.m., police received numerous 911 calls reporting gunfire at the YouTube campus located at 901 Cherry Avenue. When officers arrived, they encountered numerous employees fleeing from the building. Police Chief Barberini called it a "very chaotic scene." Officers found one victim who an apparent gunshot wound to a lower extremity towards the front of the building. Several minutes later, while conducting a search of the premises, officers found a woman with what appears to be a self-inflicted gunshot wound. Additional victims were found at a nearby business. A spokesman for San Francisco General Hospital says it received three patients, two women and a man. Spokesman Brent Andrew says a 36-year-old man is in critical condition, a 32-year-old woman is in serious condition and a 27-year-old woman is in fair condition. The hospital does not expect to receive any additional patients from the shooting. A YouTube employee tells CNN she saw one person shot on the patio where they eat. One YouTube employee said during the shooting people were trying to get out of the building "as fast as they could." "We were all suddenly aware of a lot of noises, of sounds, people running outside of the room where she was. And people screaming," said the employee, who was in a building down the street. 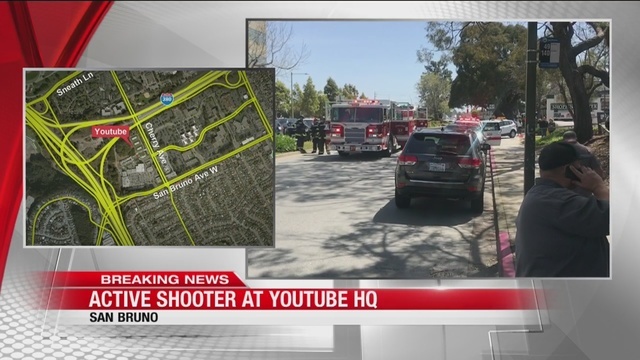 Another YouTube employee says the fire alarm went off at the company's headquarters and workers didn't realize it was an active shooting. Senior software engineer Zach Vorhies said he and others were calmly leaving the building when he saw a shooter in a courtyard yelling, "Come at me, or come get me." City Manager Connie Jackson says they've received multiple 911 calls from YouTube reporting a shooting. 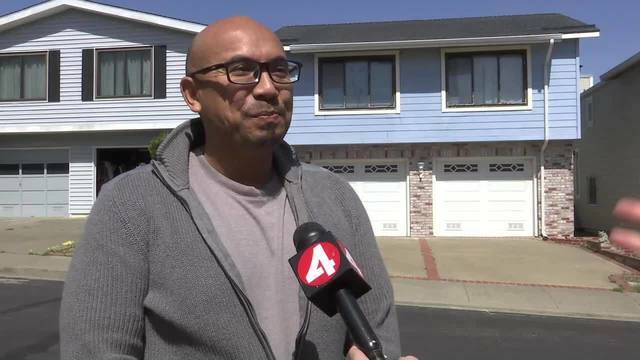 A witness told KRON4's Gabe Slate they heard two or three shots and later about 10 shots. He was at a Carl's Jr. fast-food restaurant across the street from an end of the YouTube building where there are tables with umbrellas on a patio. He also told Slate that a woman ran over to the Carl's Jr. with a leg wound. People at the fast-food restaurant tried to use napkins to stop the bleeding. San Bruno Police tweeted at 1 p.m. to avoid the area due to police activity. Employees were seen walking out of the building with their hands up. Google, which owns the online video website, posted on Twitter that the company is coordinating with authorities. Google has also set up a helpline for their employees. YouTube, which was founded in February 2005, quickly became the most well-known of several online video sites. In 2006 Google said it was purchasing YouTube for $1.65 billion in stock. More than 1,100 people work at the YouTube office in San Bruno. Employees there include engineers working on site search, infrastructure, content channels and ad products; and sales teams that work with advertisers and content creators. 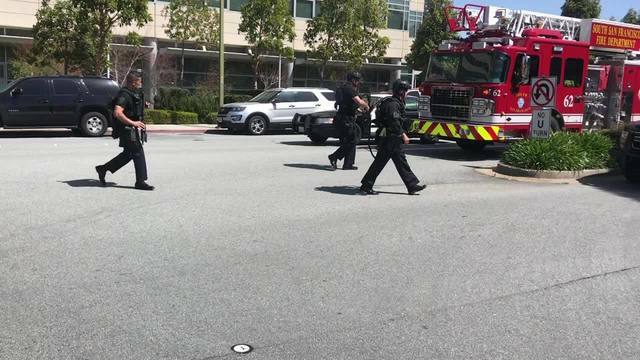 On Tuesday, April 3, 2018, at 12:46 p.m., the San Bruno Police Department received numerous 9-1-1 calls reporting gunshots at the YouTube Campus located at 901 Cherry Avenue in San Bruno. San Bruno Police Officers arrived on scene at 12:48pm and immediately entered the building to search for a possible suspect. Arriving officers encountered numerous employees fleeing the premises. Officers encountered one victim with an apparent gunshot wound at the site and two additional gunshot victims that had fled to a neighboring business. Inside the complex officers located a deceased female inside with a gunshot wound that is believed to have been self-inflicted. A total of four people were transported to local hospitals, three of which were suffering from gunshot wounds. The extent of the victims’ injuries are unknown at this time. agencies. Tactical teams then conducted a thorough search of the campus located at 901 Cherry Avenue. No other suspects were located, nor are there additional suspects believed to be associated at this time. The scene is currently being processed for evidence by San Bruno Police Detectives and the San Mateo County Crime Lab. The deceased, pictured below, has been identified as Nasim Najafi Aghdam a thirty nine year old female resident of San Diego, CA. The San Bruno Police Department is investigating a motive for this shooting. At this time there is no evidence that the shooter knew the victims of this shooting or that individuals were specifically targeted. Anyone with any information related to this crime is urged to contact the San Bruno Police Department at (650) 616-7100 or by email: sbpdtipline@sanbruno.ca.gov. Information can be left anonymously.